CasinoEuro has the best games for you. The casino was formed in 2002 and is under the management of BML Group Limited. The casino is listed under the authority of Malta and United Kingdom.The casino has been proven fair by independent auditors and is highly protected. The casino is white in color with blue color highlighting all the important sections of the casino. The website has a menu bar where you click and get access to all the games, promotions, change of language, customer support, and their blog. Some of the games offered in this casino are slot games, video poker games, and table games. The casino offers goodie bags for each day. Each day you get a special treat from the casino. 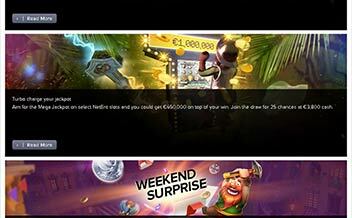 You either get free spins to prize pots, to lucky spins. 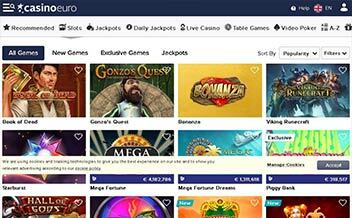 The casino has other amazing offers and promotions such as Daily No Wager Free Spins, Your Weekend Surprise, The Casino Euro Blog, A Guaranteed Daily Jackpot, and The €25,000 Summer Special. The casinos’ slot games are thrilling. Some of the slot games are Starburst, Bonanza, Wild Scarabs, Twin Spin, Yeti, Golden Ticket, Laser Fruit, and Mr. Toad among many others. The casino has the best table games; some of the games are Beat Me, Swap the Flop, Red Dog, Punto Banco, Pai Gow, Blackjack, Casino Patience, Roulette, Pontoon, and Casino Hold’em. Poker lovers are neither left behind; some of the games are Joker Wild, Deuces Wild, All American, Joker Wild, Jackpot Poker, and Jacks or Better. The casino’s game suppliers are Microgaming, Red Tiger Gaming, Thunderkick, NetEnt, Ash Gaming, NextGen Gaming, and Evolution Gaming among many others. Some of the restricted countries are Tanzania, Namibia, Iraq, Ukraine, Israel, Uganda, Algeria, Botswana, Burkina Faso, Haiti, Bangladesh, Gambia, China, Djibouti, Ethiopia, Kenya, and Netherlands among many others. Forms of withdrawal and deposit are Entropay, Master Card, Neteller, Skrill, and Bank Wire Transfer. 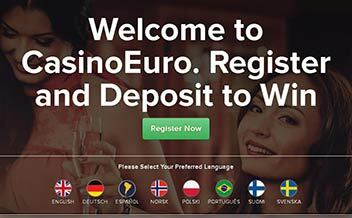 The currencies used in this casino are EUR, USD, GBP, CZK, and SEK. 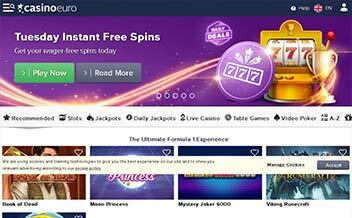 The casino can be accessed via major browsers such as Opera Mini, Chrome, and Mozilla. The casino has made its software compatible with mobile gadgets software. You can play at your own luxury because the casino is instant play. The casino has no withdrawal limits. It supports nearly up to eight languages. You can withdraw money even on weekends. It has been proven fair by independent auditors. Calls to customer care are charged. It has no VIP club. The casino has over the years provided the most thrilling and exciting games for its players and is now celebrating 15 years of good work and excellence. The casino has state of the art security system and you can be assured of your privacy. The casino has no unresolved issues hence you can be assured of quick problem-solving. Be part of this casino today.